Homebuilders are skipping the starter homes and moving straight to middle-grade houses. Well folks, this is just the free market at work. For homebuilders, the market is telling them it doesn’t make financial sense to build starter homes, even though the younger generation needs starter homes. Clearly, not enough of them need a starter home right now, or the market would react and supply them. Although the media may make this out to be a big problem, it’s not. None of these young families are being forced to choose homeownership, and many of them are not. We do not need any government regulation to fix this lack of starter homes. I’ve included a second article that talks about how federal lawmakers and the New York Times are putting pressure on the Federal Housing Finance Agency to stop Freddie and Fannie from selling their foreclosed homes to businesses that end up seller financing them. You have all these liberal reporters and lawmakers going after “predatory” businesses that are willing to risk their money, not once, but twice. First, when purchasing homes from and again, when financing the purchase for the homeowners they are trying to help. Short of the investors just giving the homes away, I can’t figure out what is wrong with helping others become homeowners while making money on the risk you’ve taken. There are many homebuyers who can’t get traditional financing for various reasons. They often have credit blemishes of some sort and it is also hard to find lenders to finance loans in lower price ranges. That’s why these investors have stepped in to fill the void in the market. If someone wants to be a homeowner and an investor wants to carry the mortgage for the homebuyer, what is wrong with that? Will it be perfect? Of course not, but neither is traditional financing and the homebuyers that utilize that route. Let the free market work and we will all be better off. Will the Starter Home Return? Homebuilders say they’re struggling to deliver on the demand of lower-priced entry-level homes that cater to the growing number of willing millennial buyers, arguing that more entry-level homes will hurt their bottom lines. Few starter homes are available on the market today through existing homes too. During the Great Recession, investors purchased hundreds of thousands of foreclosed properties—low-priced starter homes—and converted them into rentals. They’ve been holding on to these properties, which has spawned an even bigger deficit for lower priced homes on the market. “I don’t think anyone’s doing jumping jacks in terms of that lower end of the market, but I do think you’re also seeing … a little slowdown at the middle end, because that’s where the bulk of the recovery has been so far,” says McGrath. The median price of a new home built in March was $315,000. The median price of an existing home was $236,400. Builders are gradually introducing new lines at lower price points. “People are doing more townhomes in good locations, and they’re also stripping stuff out of the house to get the price cheaper,” says John Burns, CEO of John Burns Real Estate Consulting. Some builders are introducing lower-cost lines of homes, but while they’re lower-cost, they aren’t considered starter homes, CNBC reports. The cost of building a starter home isn’t lucrative enough for builders, industry insiders say. “It’s always a tug of war in builders between order growth and gross margins,” McGrath says. “Those are the two things that investors pay the most attention to. That really tends to be what drives the stocks.” Demand is clearly growing among young buyers, however. New-owner households are now outpacing renter households, according to the latest Census data. Lawmakers are pressing the Federal Housing Finance Agency, which oversees mortgage financers Freddie Mac and Fannie Mae, to limit or stop the sale of foreclosed homes to firms that resell them under rent-to-own contracts, or contracts for deed. 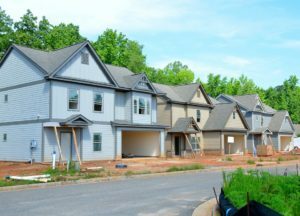 In a Senate hearing held May 15 on the future of Fannie Mae and Freddie Mac, FHFA director Melvin Watt promised that his agency would act to limit the sale of nonperforming homes to firms looking to resell through contract for deed. Some local authorities and regulators are taking legal action against several of these firms, accusing them of engaging in predatory business practices by reselling these often rundown houses “as is” through rent-to-own and other seller-financed transactions, sometimes known as contracts for deed.